Sixty-two migrants stranded at sea for more than a week on the German rescue ship Alan Kurdi landed in Malta late Saturday after four European Union countries agreed to take them in. "Through the coordination of the European Commission, with the cooperation of Malta, the migrants on board the NGO vessel Alan Kurdi will be redistributed among four EU states: Germany, France, Portugal and Luxembourg," a statement from Malta's government read. "None of the migrants will remain in Malta," it said, adding that the "smallest member of the European Union" could not keep shouldering the burden of taking in migrants. The government refused to allow the Aalan Kurdi to dock. Instead, the rescued migrants were transferred to a Maltese military vessel, which took them to the Maltese capital Valetta. The German Interior Ministry confirmed that 26 of the migrants would be taken to Germany. The ministry said in a post on Twitter that Germany had "raised its acceptance level" in agreeing to take the migrants. The Alan Kurdi rescue vessel, named after a three-year-old Syrian refugee boy who drowned in 2015 while trying to reach Europe with his parents, is run by the German non-governmental organization Sea-Eye. 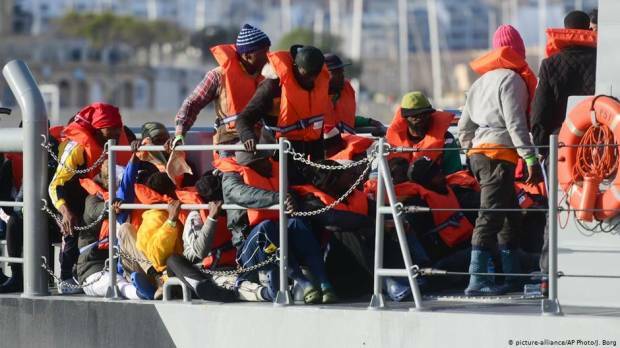 The migrants at the center of the current dispute were rescued near Libya on April 3, but were denied permission to land in Malta or Italy. Initially, 64 migrants were rescued, but two women were taken earlier this week to Malta for medical treatment. Sea-Eye said that one crew member was also transferred to Malta overnight with symptoms of exhaustion. Malta and Italy have taken a hard line on migrants crossing the Mediterranean from North Africa in an attempt to enter Europe. Malta has refused to allow migrant rescue ships into its ports, arguing that their operations off Libya served to encourage human traffickers.